In 2016 I held two Digimon Celebrations, mini fan conventions focusing on the almost twenty-one-year-old multi-media franchise that began in 1997 in Japan as a series of virtual pet toys. Our venue for these events, the wonderful Victory Pointe, had a full kitchen and amazing cooks who prepared burgers, milkshakes, and more. We talked about having a few Digimon related food specials at the first event, but a week before we got crazy creative and ended up making a full Digimon inspired menu. Some were just giving cute names to already existing food items, but some were more complex. 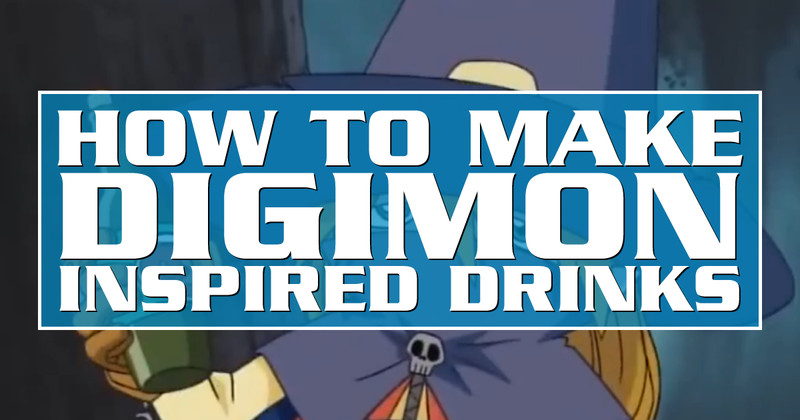 Let's look at some of the best Digimon inspired drink recipes I helped create. What is Mimi’s favorite color you ask? It’s pink, obviously. It’s not stated much, but the lovable airheaded Digi-Destined who wishes she had gone to cheerleading camp is always seen wearing her pink cowboy hat and pink dress. Aside from being scared, tired, walking, sitting, and giant monsters trying to kill her the one thing Mimi hates the most is being hot and sweaty. 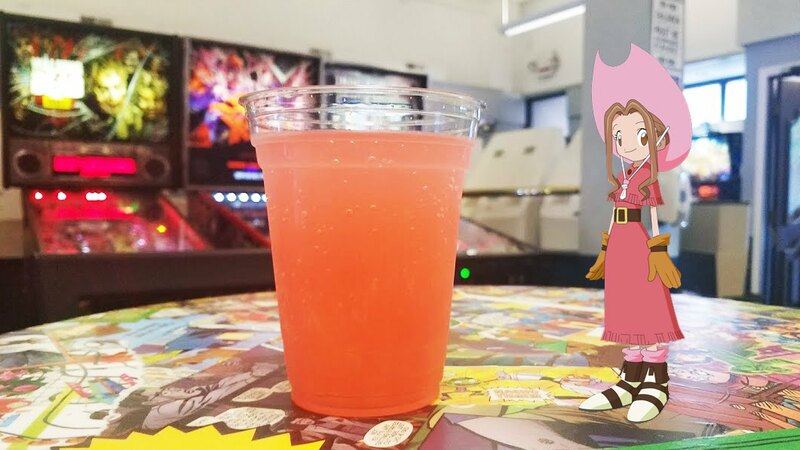 To create a drink that Mimi herself would actually drink to cool off on a sunny day in the Digital World, we looked to her favorite color. We started with pink lemonade as a base and experimented with different combinations of pink flavored syrups in the mixture. We settled on strawberry and watermelon. Not only do the three pink flavors taste great together, the colors settle in a way that makes them look like a cocktail when in a clear cup. Optional Twist: One shot of vodka. One of my favorite episodes of Digimon Adventure is the one where Myotismon’s two most unlikely henchmen decide they’d rather run around and play than help a vampire on his quest to murder children. After bonding with T.K. and Matt as they goof off in Shibuya, the two eventually rebel against Myotismon and are promptly “banished to a dungeon in the Digital World” if you know what I mean. Distilling these one-episode-wonders into a drink was not as hard as you might think. I had to incorporate two flavors into one mixture and make it not disgusting. Pumpkinmon? Pumpkin spice, check. Gotsumon? That was trickier. Pumpkin spice rock candy isn’t exactly much to go on, so I thought about how the flavors would actually taste. Pumpkin has a sweet “foretaste,” so I needed a good aftertaste. Root beer has a unique flavor, I can’t really describe it. But I’m always reminded of these old ads for Barq’s that said it had a “bite.” An obvious pun on the brand’s name sounding reminiscent of the sound a dog makes, but they had a point - root beer does have a bite to it. 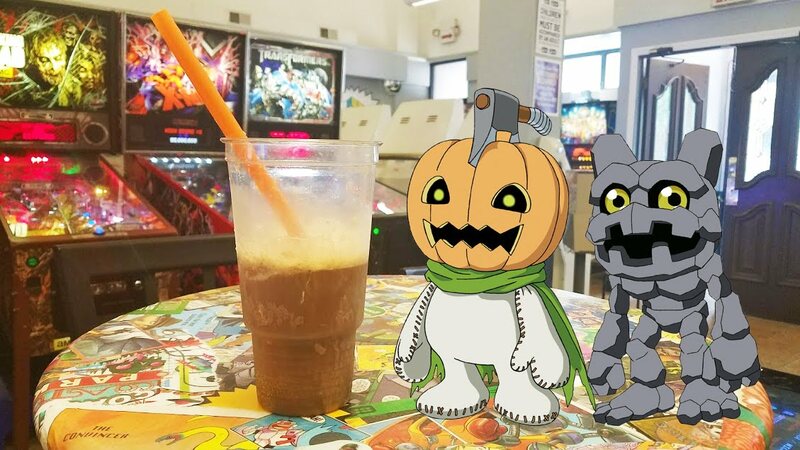 Somehow that clicked in my head as Gotsumon-esque and we settled on a pumpkin spiced root beer float. I later went back to the staff after a lightbulb went off for me: a rocky road root beer float! Like root beer, rocky road is kinda defined by whoever is making it, as there are examples that involve peanut butter, caramel, nuts, even pretzels. I went with a standard chocolate and marshmallows twist and it worked perfectly. 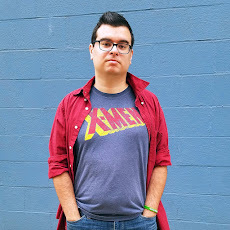 Jeff Nimoy served as writer, director, and star of the US versions of Digimon through its first two seasons and the movie. He returned in the fifth series, Data Squad, with much more creative freedom. One moment where he had to stand down was the infamous Citramon episode, where a bomb-slinging, bomb-shaped Digimon named BomberNanimon had to be either changed or cut. Not wanting to lose a nice character story, Jeff found a way to make it work. 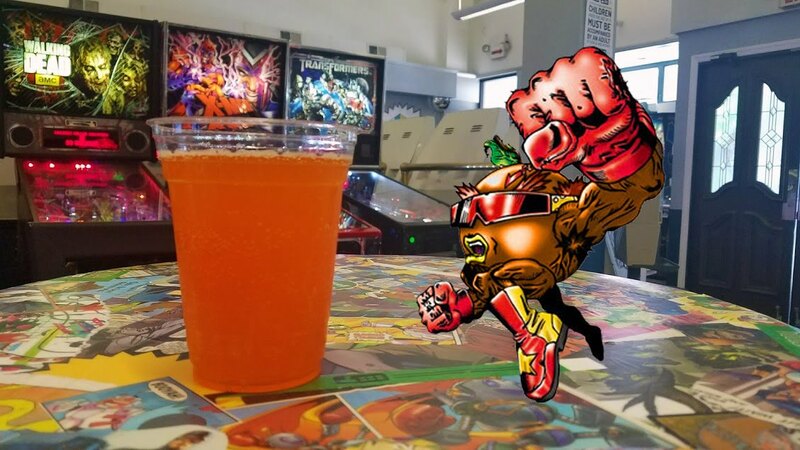 Enter Citramon, an orange-slinging, orange-shaped fruit kaiju monster that terrorized an amusement park with the threat of too much Vitamin C.
Fans assumed for the longest time that this change was the result of post-9/11 fear of connecting imagery of explosions in public spaces to terrorist attacks. In actuality, it was a more business-driven approach from Digimon’s then owner: Disney. Operating some of the most popular amusement parks in the world, the House of Mouse wasn’t about to run a show where a giant bomb explodes a roller coaster. Flooding it with juice was better, I guess? So how and why did this become a menu option? Reason #1: I think it’s hilarious. Reason #2: I love Jeff Nimoy and hold a lot of respect for the work he’s done with Digimon, especially Data Squad. Reason #3: Victory Pointe had recently run a Star Wars inspired menu and already had a fruity orange drink. The “BB-8” was simply Orange Crush soda with a shot of mango. That’s it. We called it Fruit Punch Nova, named after Citramon’s special attack, and yes people ordered it. Those are the three most original - and most popular - items we created for the two Digimon Celebration events. Have fun recreating them and let me know how they come out! I like that these come as non alcoholic as well.